TriCure Soil Surfactant Pellets are formulated for use as a fast, convenient method of applying TriCure Surfactant through hose-end applicators to prevent and treat hydrophobic soils. Pellets are designed to dissolve quickly to allow fast application with chemical dosage sufficient to effectively treat and prevent hydrophobic soils. Pellets can be used as a supplement to regular water management programs or as a stand-alone method of treating soils. TriCure Pellets are designed to dissolve quickly, normally between 8-15 minutes, allowing an effective application of TriCure AD to be applied in the normal syringing time on greens or hot spots. Other pellets take between 45-60 minutes to fully dissolve, allowing very little chemistry to be applied without excessive syringing. Use of TriCure Pellets is an effective way to apply the TriCure AD chemistry, which will act to quickly cure existing LDS and prevent reoccurrence. Less time is typically needed to syringe hot spots with TriCure Pellets than with other competitive products. With a typical melt time of 8-15 minutes (depending on water temperature and pressure), TriCure Pellets can be used to apply an application of TriCure AD chemistry to extend a surfactant spray cycle. The 6 ounce active in each pellet when applied to a 6000 ft2 golf green, allows approximately 1 full ounce of TriCure chemistry per 1000 ft2 surface when a full pellet is applied during syringing. Most soil surfactants fall into the classification of either horizontal wetters (HW) or penetrants. HW are designed to hold water at or near the surface of a root zone; in principle, making more water available to the plant roots. Penetrants, typically containing nonylphenol ethoxilates or alcohol, tend to move the chemistry and the water downward to lower soil levels. Both have advantages and disadvantages, but optimally, water should be both retained in and move throughout the full root zone depths. TriCure is designed to move both vertically and horizontally to achieve optimum distribution and retention at all soil depths. Drought stress can have severe negative effect on both playing conditions and plant health, including making the plant more susceptible to certain turf diseases. Improving the water management on drought prone areas through the use of TriCure Pellets will enable the turf to both recover quickly from drought stress, and reduce potential incidence of certain turf diseases. 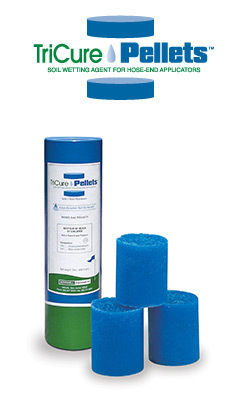 TriCure Pellets are shipped in cases of 36 pellets. Each case contains 12 tubes, each carrying 3 pellets. These convenient tubes make it easy to carry and handle multiple pellets, while minimizing the waste and excess plastic used for competitive products.